Disclaimer: I am a client and friend to Sean Pangelinan and The Fit Lab. The views expressed here are solely mine, and do not represent UC San Diego School of Medicine. This writing should not be constituted as medical advice. Background: I am a former collegiate Track and Field athlete (hammer throw) at UCSD, turned academic. I earned a Masters in exercise physiology from San Diego State and then a PhD in cardiopulmonary exercise physiology from the University of Alberta. The theme of my research is the pulmonary vascular response to exercise in health and chronic lung disease. I met Sean Pangelinan when I was a graduate student at SDSU. I was his laboratory instructor for ENS 304, undergraduate exercise physiology lab, and he was an excellent student. We kept in touch after we both moved on from SDSU, and years later, I was happy to learn that Sean had started his own business and continued to apply the evidence based knowledge in exercise training. The Fit Lab: Shortly after finishing my PhD in Canada, I moved back to San Diego to start a Postdoctoral Fellowship at UCSD. Over the years I attempted to keep active, picking up mountain biking in the summers and ice hockey in the winters while living in Canada. Near the end of my doctoral work, I was not exercising, worked late hours, and ate poorly despite being an exercise physiology researcher. I found myself wanting to make serious changes to my lifestyle through exercise and nutrition. I contacted Sean to get onto a training program to facilitate reaching my goals. I started my transformation program on August 14, 2017 with a consultation and body composition test (hydrostatic weighing for body density). I started at 246 lbs and 30.3% body fat. Together, we set my goal to 200 lbs at 15% body fat. Strength Training: My program consisted of three days a week of resistance training and mobility work (M-W-F), which was dubbed ‘Gentleman’s Training’, training with a few other partners in a small group. Week 1 was extremely tough as I had lost a lot of strength from previous training and sedentary lifestyle. Having been a strength athlete in my college 10 years ago, I was familiar with resistance training and quickly re-gained my competency and strength under the bar. Most notably, the neurological adaptations came quickly and I found weightlifting to be enjoyable again. The workouts are a tough, guided 50-minute lifting sessions which vary throughout the week depending on body part and the overall training cycle. After two months of strength training and prescribed nutrition plan (described below), I was down 22 lbs and 5% body fat. My weekly schedule then changed, and I dropped one weightlifting day in favor of adding two days of High Intensity Interval Training (HIIT) circuits. Circuit training: HIIT training days consisted of high repetition, low weight (often body weight) exercises, which vary throughout the week. As a strength athlete, the high-rep counts were a foreign concept to me, but I enjoyed improving my speed and endurance, and working towards an overall goal of cardiovascular fitness. Working in a small group built camaraderie, and a built-in sense of personal responsibility. Exercises include plyometrics, battle ropes, various medicine ball tosses, running and speed drills, and on recovery days, yoga stretching and joint/muscle activation. Circuit days are never boring, and I always looked forward to challenging myself beyond what I felt like my body could accomplish. Nutritional plan: In addition to the Gentleman’s training, Sean suggested a nutritional plan that severely restricted my carbohydrate intake to 20g per day, with moderate protein intake, and relatively high fat intake, also known as the Ketogenic Diet. I’d heard much about ‘Keto’, with a seemingly ridiculous amount of saturated fat as the bulk of the macronutrient intake. The Ketogenic diet was introduced by physicians in the 1920’s as a non-pharmaceutical treatment for epilepsy, and has regained contemporary interest and is a growing trend in biomedical research. The basic tenet of the Ketogenic diet transitions the main fuel for metabolism from carbohydrates (glucose, glycogen) to fat, while still maintaining a caloric deficit. Over time, the body adapts to burning fat as a primary fuel source. There is still quite a bit of controversy over the ketogenic diet, but being keen on self-experimentation, I committed to this plan. In the first week, I bought a kitchen scale and meal prepped 5 days’ worth of lunch and dinners, which included lots of chicken breast, salmon, eggs, and beef. Week-long meal prep did not work well for me as I did not find 5-day old precooked chicken breast appetizing in the least. I do enjoy cooking, so I cooked fresh meals every night with a bit extra for lunch the next day. I recorded all my food and water intake to the gram on MyFitnessPal for 3 months. In the first month, I was eating 1800 calories daily, for a deficit of 400 calories (my daily caloric expenditure was approx. 2200). The first week I dropped 6 pounds, due to the loss of retained water after clearing my muscle and liver glycogen stores, but didn’t feel great. I suspected that my headaches and malaise were due to electrolyte imbalance, and I immediately felt better after supplementing with 500mg magnesium, as well as potassium salt-substitute (Lite Salt ~750mg potassium per 1/4tsp) mixed into a pint of ice water or crystal lite 3-4 times a day. The calorie and food restriction were quite difficult in the first few weeks, but I figured out what worked for me without feeling restricted. After two months, my weight loss stalled around 230 lbs for three weeks. To push through this plateau, I transitioned to ~1300-1500 calories per day. Along with HIIT training, I began to incorporate intermittent fasting (IF) into my schedule. Basically, I would maintain my usual caloric intake but restrict the feeding to certain hours of the day. The next 3-4 weeks I would only eat between 12pm and 8pm, giving myself an 8-hour window to consume all of my food. Breakfast was only a 473ml thermos of good black coffee. I had some good success with this, losing weight at a faster rate. Having read more research on IF and time-restricted feeding, I started a 23:1 pattern, only eating once a day in the evenings immediately post-workout. Now, I follow 18:6 most days, and 23:1 on HIIT training days. Some research shows that IF promotes autophagy (eating own cells) of fat and excess skin, with adequate protein to minimize lean muscle loss. Summary: Working with the Fit Lab has allowed me to create reasonable, actionable goals, and has helped me reevaluate my relationship with food and exercise. With my existing knowledge, we created a plan to reach these goals, guided by the scientific literature. 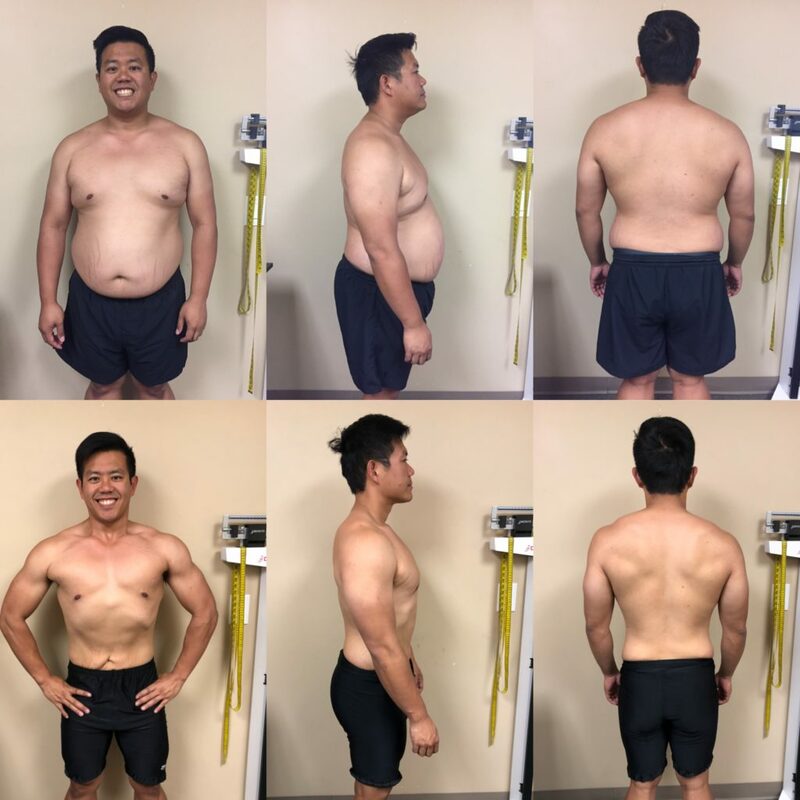 Sean is knowledgeable and flexible; his positive attitude and glowing personality motivates his clients to take ownership of their own transformation in order to promote a behavioral lifestyle change that is able to be maintained after reaching their personal goals. It has been fun discovering what my body and mind can do with the proper motivation and knowledge, and I have formed new friendships with other clients. As one might expect, hiring a trainer is not exactly cheap and may not fit into your budget or schedule. But, it is cheaper and more fun than eventual medical and pharmaceutical interventions that arise from chronic lifestyle diseases such as diabetes and hypertension (and sick time you might take). Like all other academics, my schedule revolves around data collection and grant/manuscript deadlines and despite knowing better, I spend an enormous amount of my life on sedentary screen time. I needed to change, so I made a decision. My journey to fitness is a result of a combination of resistance/strength training, HIIT circuit training, calorie restricted ketogenic diet, and intermittent fasting. There is no one-size-fits-all exercise or nutrition program, and I am lucky to have access to the resources to assist my journey. The Fit Lab transformation takes my lifestyle into consideration, working around old injuries with corrective exercises, proper stretching and recovery to in a comprehensive program. So, if you want to make a change, contact Sean at the Fit Lab today to start your personalized, quantified transformation. Who do you want to be in 12 weeks?